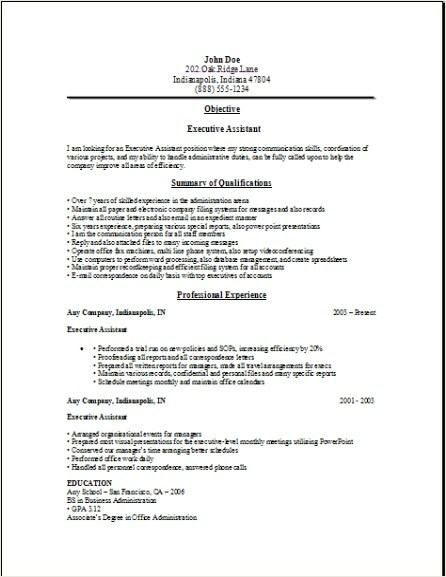 The executive assistant resume sample one, you use here, should represent your own professional skills you have attained with your experience as an administrative assistant. Your unique resume that you create with this sample resume should be used to best describe your own past experience you have in this field, plus, you will want to state all of your achievements. In fact, make sure you get a copy of the job description the employer put out for this position. 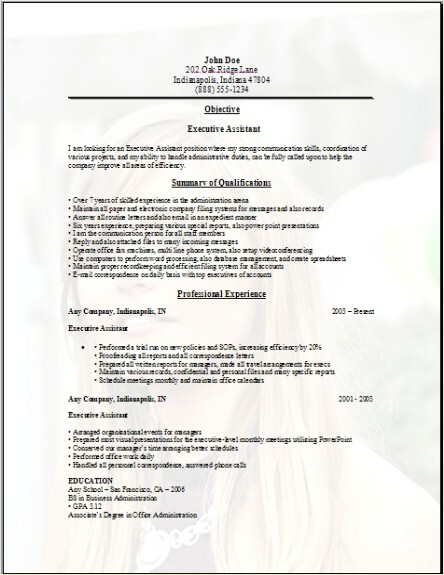 Your job will be to use this sample resume for executive assistant, and make it your own by matching all the employers specific skills they have listed on the help wanted ad they posted. This is the best way you can use your time to get an interview for this position. Put this on your must do agenda, increasing your odds for the job interview. An Executive Assistant Secretary performs a lot of routine clerical and also organizational tasks. This person will organize files, use computers to draft messages, also schedule appointments, mainly they will be the support person for the rest of the staff in the office setting. 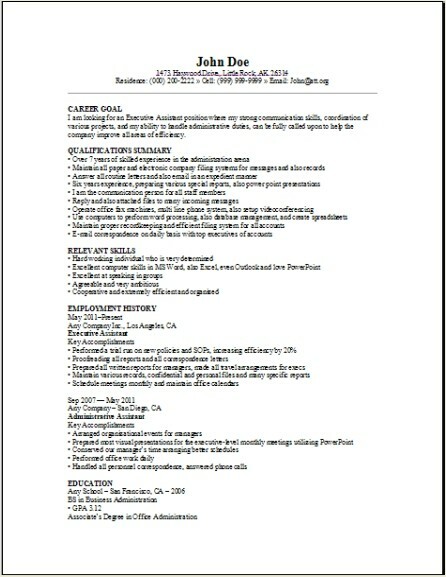 Be sure to add all of this information to your executive assistant resume sample. They will also use different computer softwares to create unique spreadsheets, use it to compose messages, help manage databases, plus they will produce many presentations, specific reports, and various documents. They probably will meet with vendors, also purchase supplies, they will manage the stockrooms and or the corporate libraries, and retrieve information from many different sources. Specific job duties always vary by the experience the person has, the job title the employer puts out, and there are also specialty executive assistants. I am looking for an Executive Assistant position where my strong communication skills, coordination of various projects, and my ability to handle administrative duties, can be fully called upon to help the company improve all areas of efficiency. High school graduates will be able to obtain basic office skills, computer skills, and also grammar skills in many various ways: you can use vocational programs, also technical schools, or some community colleges. You will want to make sure you have accomplished some formal training in the areas of computer and office skills. Look for executive assistant jobs at these places near you.